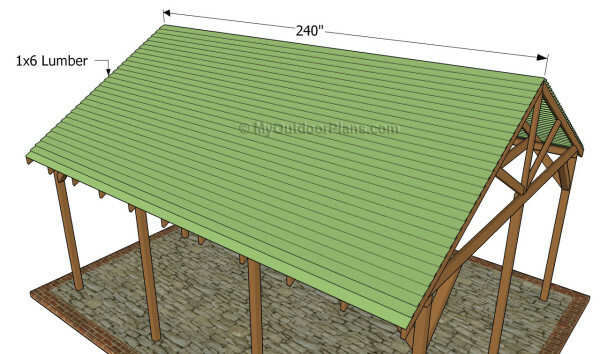 This step by step woodworking project is about outdoor shelter plans. 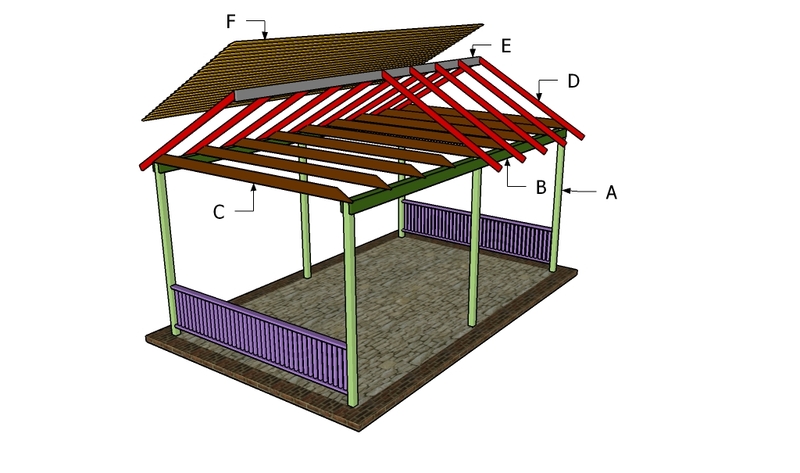 Building a simple shelter for your garden is a great project if you want to build a cheap structure, although it won’t be as spectacular as a gazebo or as a pergola. Plan every aspect of the construction (materials, plans, tools, location) from the very beginning, if you want to keep the costs as low as possible. 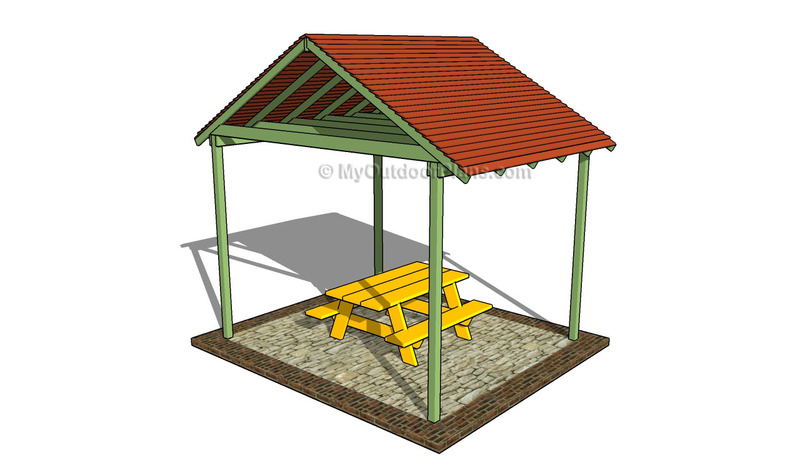 An outdoor shelter is ideal for your backyard, especially if you want to protect a picnic table from bad weather. In addition, the wooden constructions will create a large shaded area for leisure or for hanging out with the loved ones. 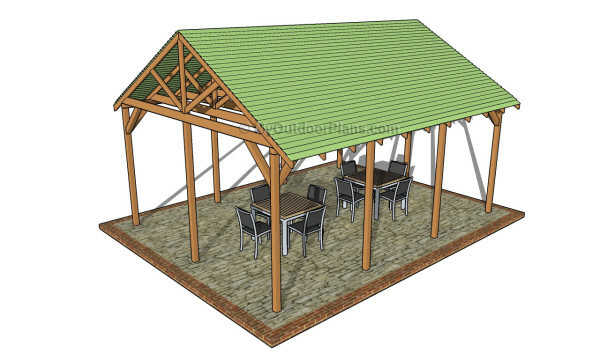 Check out the rest of the projects, if you want to see more plans for gazebos, pergola or pavilions. There are so many designs you could choose form, that we really recommend you to study the alternatives. Top Tip: Building a small shelter for your backyard is a beautiful project that can be done by any person who has the basic woodworking skills. Align the components at both ends before drilling pilot holes and inserting the galvanized screws. The first step of the project is to lay out the wooden shelter. If you want to get the job done in a professional manner, we recommend you to use batter boards and string. Make sure the corners are right-angled and the diagonal are equal, before continuing the project. You can always adjust the size and the shape of the constructions, but still use the techniques described here. Securing the wooden posts into place is not hard, but there are several options you could choose from. 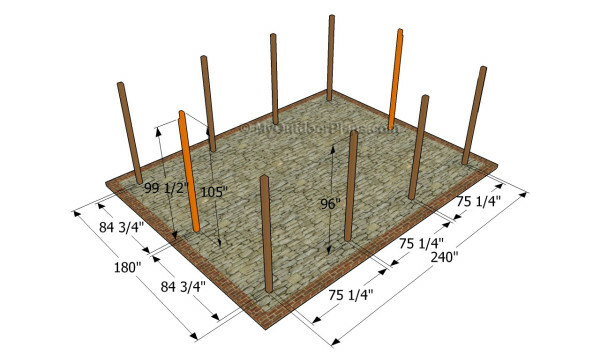 If you want to build a permanent construction, you should dig 3′ deep holes (12″ in diameter) and set the posts into concrete. Alternatively, you could fit metal anchors in the concrete footings or to attach them to a concrete slab. Plumb the posts and secure them with braces till the installation of the rafters. The next step of the project is to attach the plates to the top of the posts. 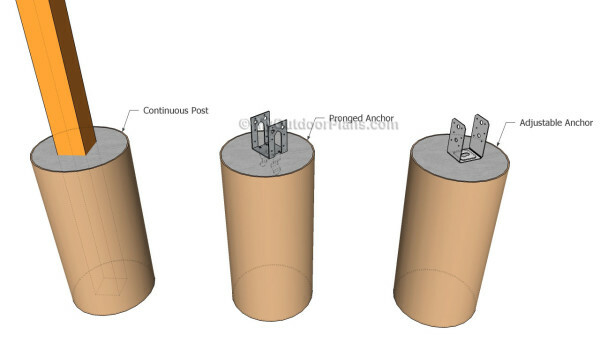 Drill pilot holes trough the plates and insert 5-6″ galvanized screws into the posts. Use a spirit level to check if the plates are perfectly horizontal. Cut the braces at 45º and attach them into place, after plumbing the posts. Drill pilot holes trough the braces and insert 3 1/2″ screws into the posts. Repeat the process for the rest of the posts. The easiest way to build the roof of the shelter is to assemble trusses on a level surface, before fitting them to the top plates. 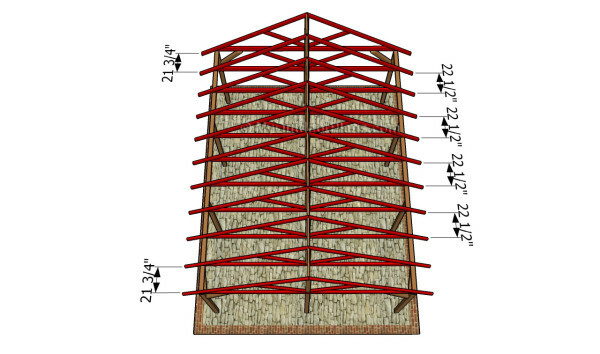 Cut the components as in the plans, using 2×6 lumber for the bottom rafters and 2×4 lumber for the rest of the components. Top Tip: Assemble the trusses on a level surface, making sure they are all the same in size and shape. Drill pilot holes, add waterproof glue and insert the screws. Ask a friend to help you when attaching the trusses into place. In addition, make sure you place them on the plates equally spaced, leaving about 24″ between them on center. Plumb the trusses with a spirit level, before locking them into place with galvanized screws and metal brackets. Fit blockings between the trusses at the top of the rafters, in order to reinforce the structure of the roof. Attaching the roof of the shelter is one of the last steps of the project, so you need to pay attention to the instructions. 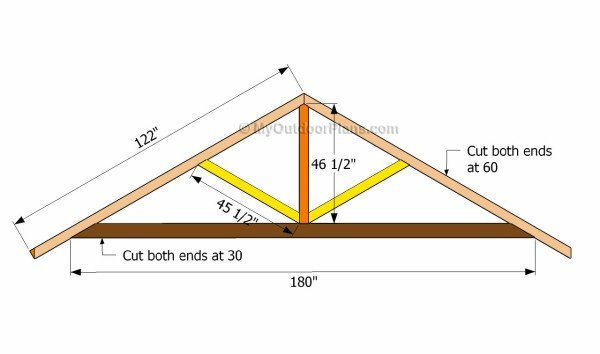 You could attach plywood sheets and cover the roof with asphalt shingles, or you could keep the costs under control by attaching 1×6 slats to the rafters. As you can easily notice in the image, the slats should overlap at least 1 1/2″ otherwise the roof won’t drain the water properly. Top Tip: Protect the wooden components from rot by applying several coats of paint. Choose colors that match the design of the rest of your property, as to enhance the look of the wooden shelter. This woodworking project was about outdoor shelter plans. If you want to see more outdoor plans, we recommend you to check out the rest of our step by step projects. LIKE us on Facebook to be the first that gets our latest updates and submit pictures with your DIY projects. 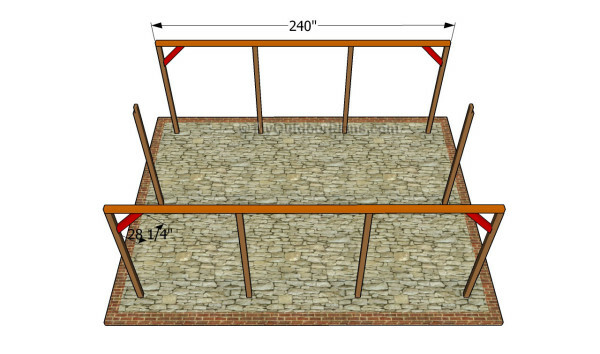 I am looking for plans for a picnic shelter that is 20 x 40, would you have something around that size? No, unfortunately I don’t have plans for a shelter that large. However, I will add your suggestion to my to do list. 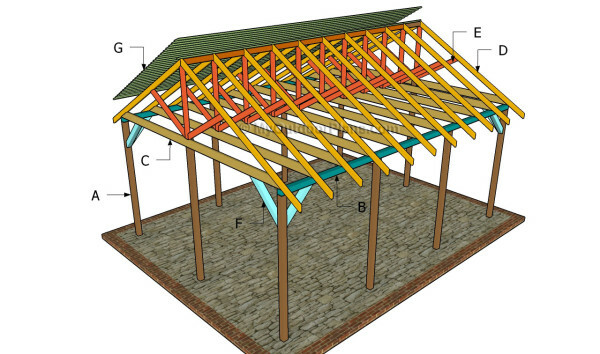 I have been looking at your roof plan for a 15′ X 20′ patio and it looks great. Do you have a similar plan for one that would cover a 10′ X 20′ area?